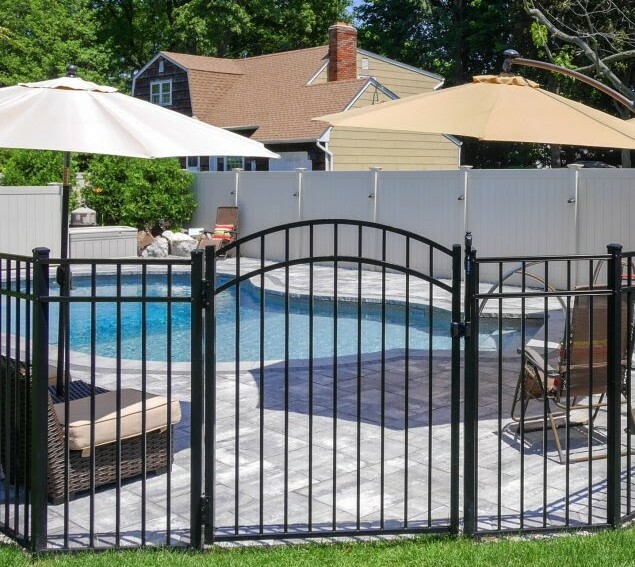 This three rail, investment quality 54 inch tall aluminum pool fence is a favorite for it’s understated elegance. As a classic, the simple, clean look is enhanced by ‘hidden screw technology’, which adds safety and beauty to your back yard pool. BOCA code compliant, these pool fence panels can be shipped in your choice of black or bronze powder coated finishes. Matching flat and arch top gate are available in four or five foot widths and a FREE Magna latch is provided with a twenty five section purchase. These fully assembled pool fence sections can be on the way to you today! Delivered the next day in the New York (Long Island, and the Hudson Valley), New Jersey, Connecticut and parts of Massachusetts and in most cases at no charge.